Following a pleasant visit to Maison Francaise back in 2013 (geez how time flies), I didn’t hesitate before accepting another invitation to dine at the romantic mansion again. 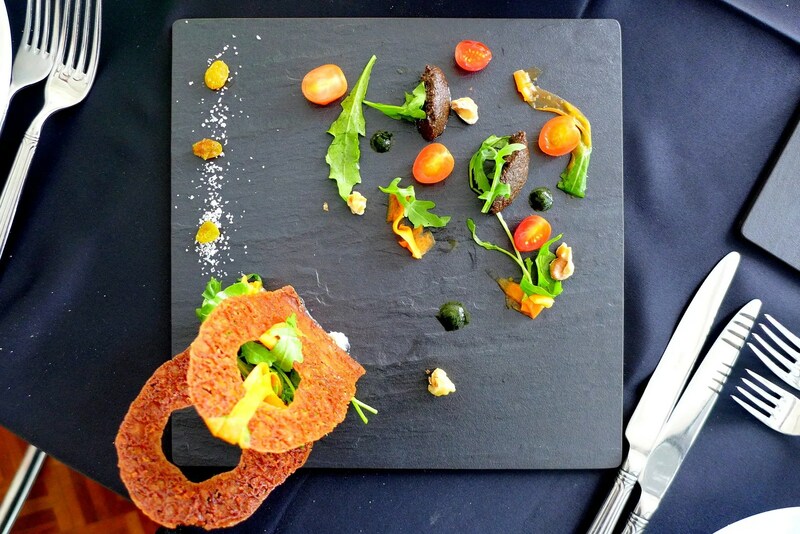 Chef Thierry Le Baut has recently taken over the kitchen and needless to say has brought some changes to the menu. Let’s take a look at the food, shall we? 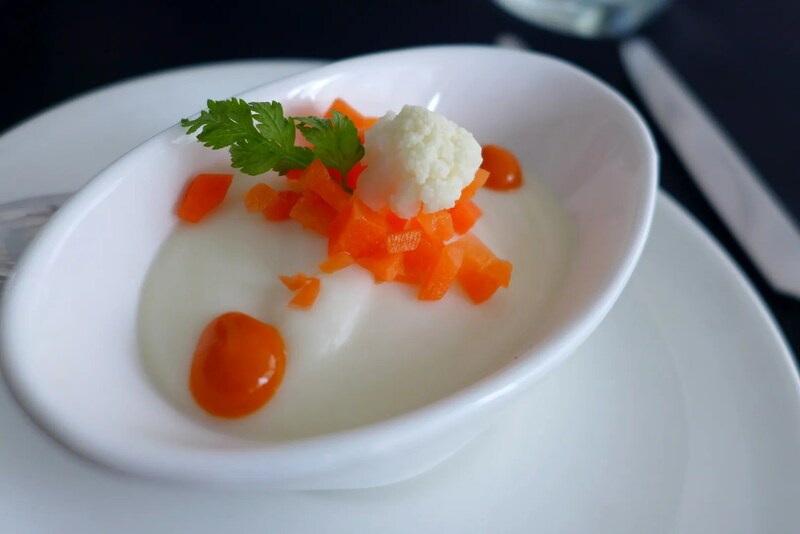 Amuse Bouche: Cauliflower Puree, Pickled Cauliflower and Carrot, Tomato Puree. If the amuse bouche is any indication, the dishes here is still kept relatively clean and definitely caters to the gluten-free market. I have mentioned more than a couple of times how much I love cauliflower and this definitely perked up my day. The puree is kept cold, and the pickled vegetables was a nice touch. Frank is usually meatless during food review, and that day was no exception. However, I think he got all the nicer dishes, take a look at this Goat Cheese Basket, for example. 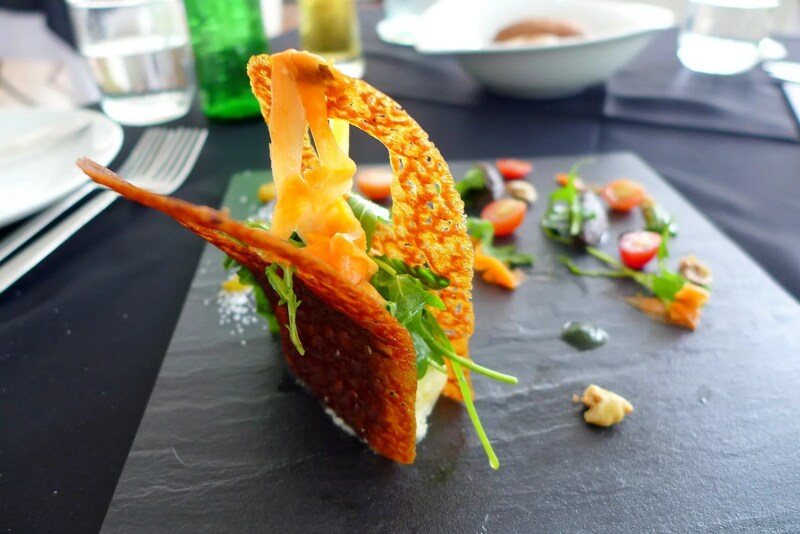 The distinct pungent goat cheese goes exceptionally well with the crispy tuille. And the umami olive tapenade completes the dish. Though it was almost a shame to dismantle the dish. 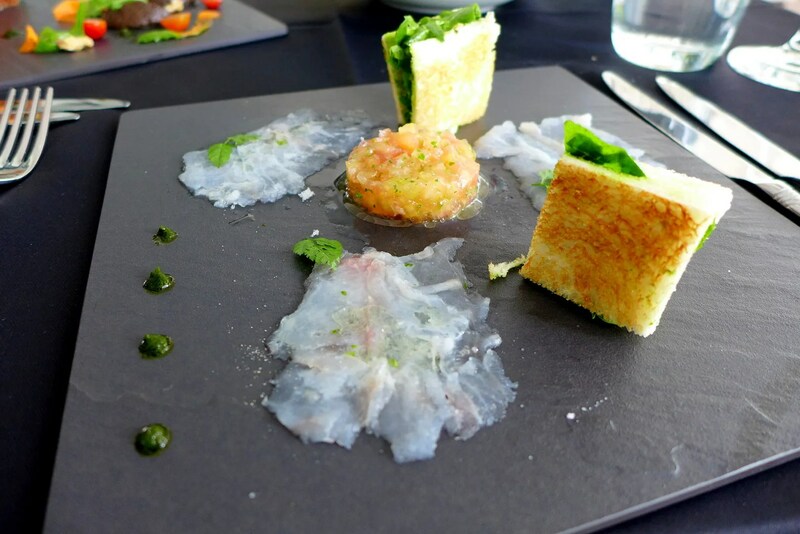 My Red Snapper Carpaccio was also elegantly presented. Food art at its best. 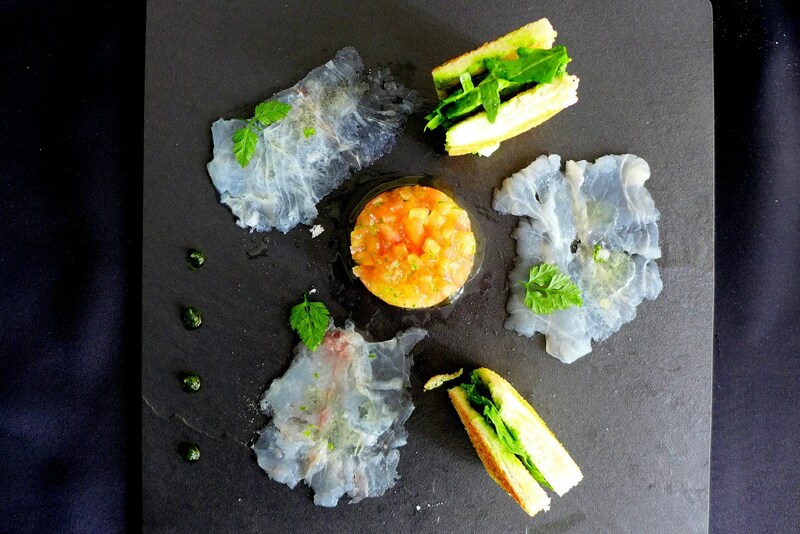 Served with a tomato and shallot “tartare”, and mini rocket sandwich, this dish is pretty pleasant. The fish is adequately seasoned and since I like rocket, I didn’t mind the bread. Although taste wise, it lacks the wow factor; a case of beauty over substance. Apart from the amusing name (brick? I know someone who should be eating brick, hmmph), this dish is very well executed. 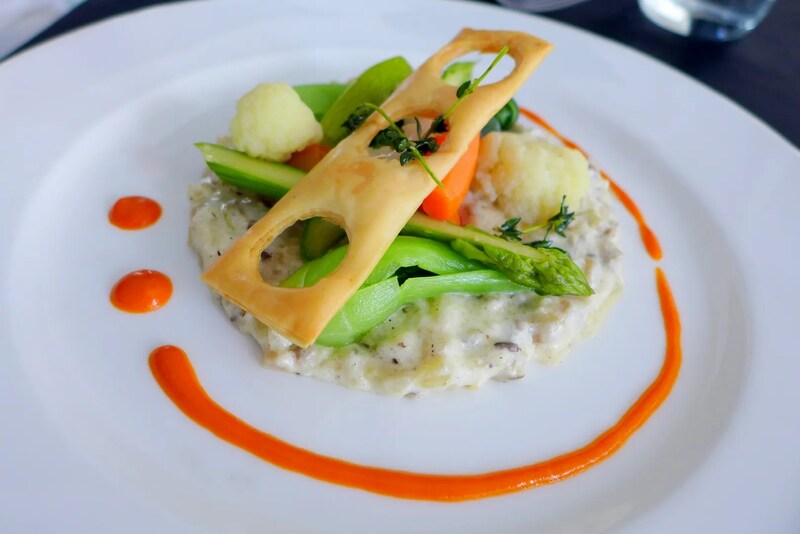 The risotto is sufficiently creamy, and infused with the delightful taste of mushrooms. The vegetables maintained a slight crunch to add a textural contrast. The Hake Fillet I received though, was mediocre at best. 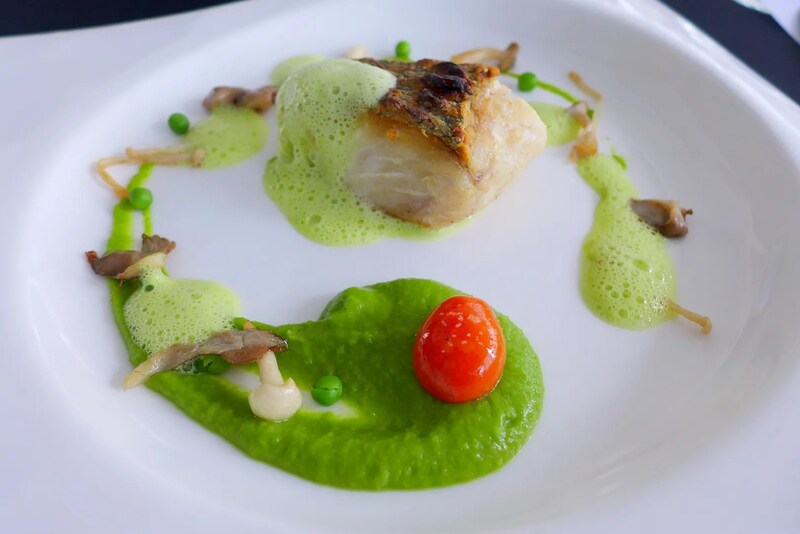 The fish was slightly overcooked hence became a little bit dry (I think you can even tell from the picture), but the saving grace is the Pea cream, obviously cooked with fish/seafood stock for that extra briny taste. I didn’t care much for the wasabi foam, which tasted pretty bland to me. I hope this is just an off day though. 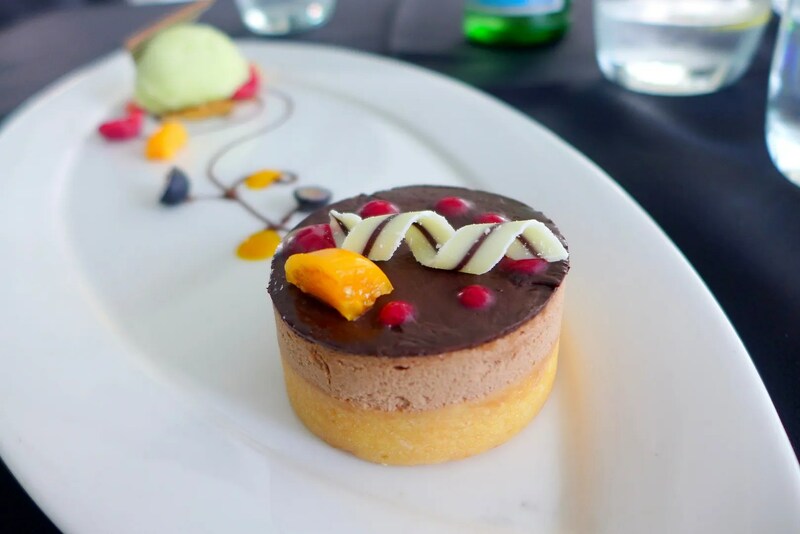 The dessert comes in a form of a tart covered with chocolate mousse, and when you take a stab, the creamy sabayon oozes out of the tart. I wasn’t sure if the tart was supposed to be a little soggy (perhaps been sitting for a while? ), but the chocolate mousse pairs well with the sabayon. The apple tart comes in deconstructed form and I enjoyed the crumbs. However the apple sorbet didn’t do much for me. This visit is a little bit hit and miss. I guess if I do go back, I will opt for non fish dishes to gauge for myself. Frank was pleased with his meal in general, so that’s good news for all your vegetarians out there.